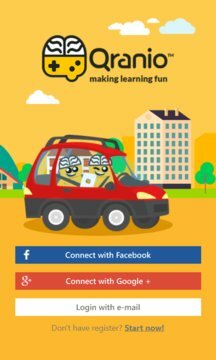 Published by QRANIO.COM SOLUCOES DE INTERNET S.A.
Qranio is an education driven app with the mission to make learning fun by stimulating users to learn at any moment with total mobility through games based on qualified, educational content while earning prizes with their intelligence. Qranio is a free, quiz based game where our user’s gain – beyond knowledge – real world prizes and Incentives. 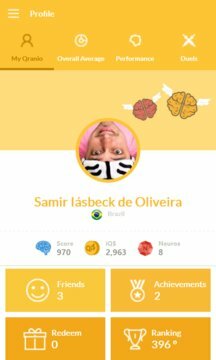 Users have the opportunity to play, learn in a fun way, gain iQ$ (virtual currency) and exchange their iQ$ for real prizes (based on availability). Practice your skills individually in a variety of categories based on your interests and for each correct answer you will be rewarded with iQ$! Not sure about the answer? Don’t worry, you still have a chance… Earn Neuros (virtual aid currency) each day you log in and use them to help you throughout the game. Ready to take it to the next level? Challenge other users to a Duel! Pick a category, the value of your iQ$ bet, and level… now you are ready to begin! The faster you respond; the more points you’ll gain. At the end of the Duel, the user with the most points wins. Qranio’s questions are separated into categories that vary from Sports to Geography to Movies and more. Users can use their iQ$ to redeem prizes (with a monthly limit and upon availability) in the Qranio Prize Store ranging from a variety of categories. The more you play, the closer you get to redeeming prizes!